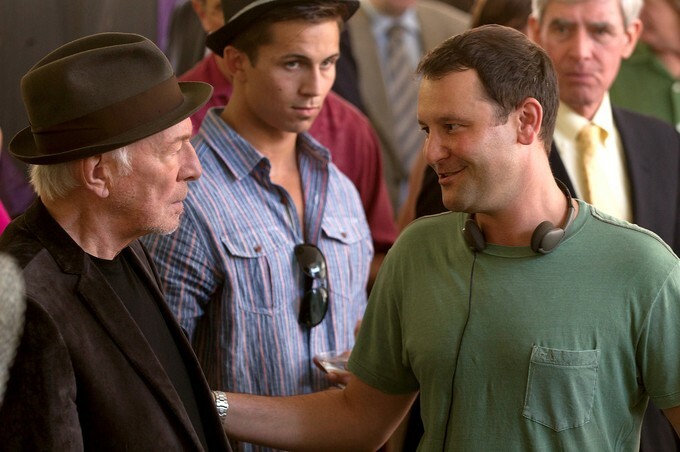 Capone talks music, nostalgia, redemption, and Pacino, with DANNY COLLINS writer-director Dan Fogelman!!! As a successful Hollywood screenwriter, Dan Fogelman has had a hand in quite a number of critical and audience favorites over the years in both the animated and live-action worlds. He’s worked on such films as FRED CLAUS, CARS and CARS 2, BOLT, TANGLED, THE GUILT TRIP, LAST VEGAS, and CRAZY, STUPID, LOVE. On the small screen, he also was a showrunner on “The Neighbors” and the recent “Galavant.” He’s also a producer on the upcoming release and huge Sundance hit ME AND EARL AND THE DYING GIRL (which I could not recommend more highly). But with his latest screenplay, DANNY COLLINS, Fogelman decided it was time to get behind the camera for the first time to tell the story of an aging rock star (played by Al Pacino) who is unhappily working the nostalgia circuit when his manager (Christopher Plummer) gives him a long-lost letter written to Collins by John Lennon when Collins was still a newbie folk singer with ambitions of being something more than a pop singer. The letter gets Collins to thinking about what he’s become, and he takes time off to rediscover elements of his life that he’d long given up on, including being a songwriter and a father to a child he hasn’t seen in decades. The film works remarkably well, especially when it captures the environment and mindset of performers who have been living off of decades-old hits. The story is loosely based on a similar letter delivered to folk singer Steve Tilston, but the similarities end there. Capone: So you heard the Steve Tilston story about this letter from John Lennon, and you saw that his life turned out okay, but it wasn’t a very cinematic story. 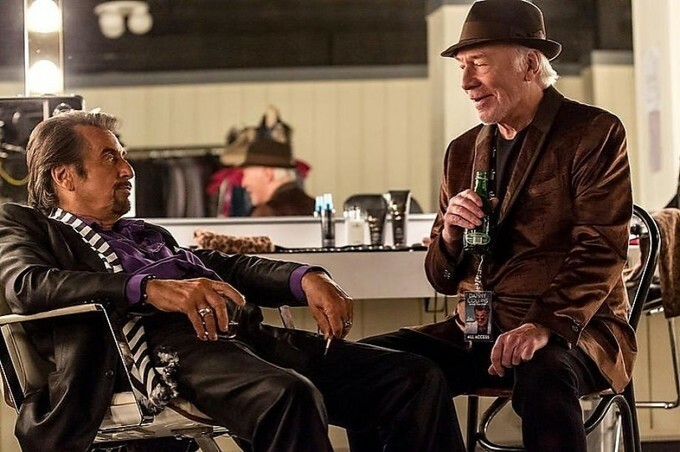 How did you then start constructing the fictional life of Danny Collins? Dan Fogelman: I knew who the character was instantly. 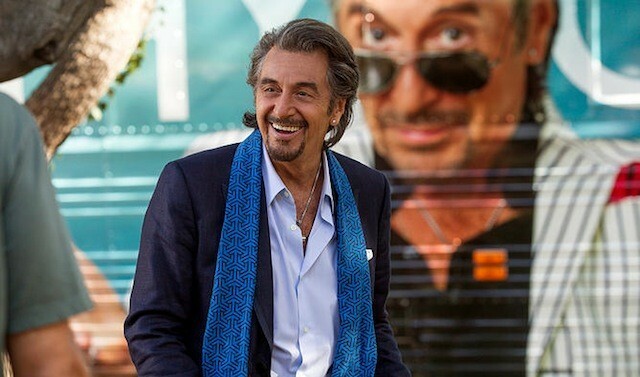 I pictured Pacino and I knew who Danny Collins was, and I knew how you’d see the dichotomy of this guy—what he started intending to be, what he became, and what would happen to him if he got the letter later in life. For me, the first step is what do I want to see this guy have to experience. I wanted it to be a family story, so that was first and foremost. There’s something that felt in my mind’s eye very lonely about this guy; he felt very alone. So I thought I’d like to see him try and connect with a family. And then we had images. 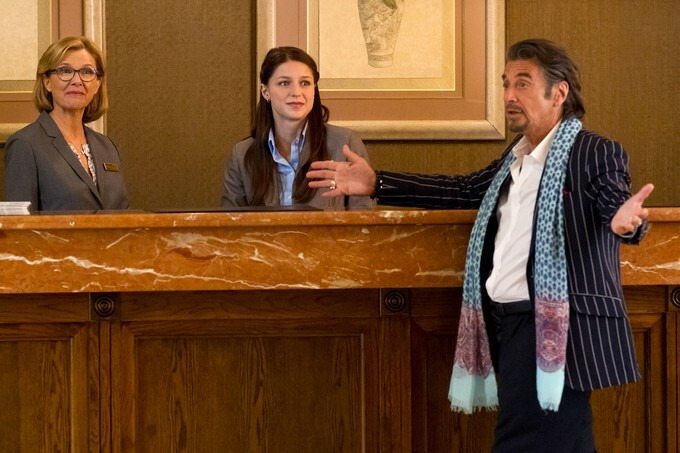 I said, I’m trying to think of where the most normal place on earth that I can imagine larger-than-life Al Pacino as Danny Collins. And I thought about the Woodcliff Lake Hilton in New Jersey, which is in the film, which is the hotel I grew up going to every 8th grade dance. I’ve been a best man at four different weddings in that hotel, back in Jersey. DF: We actually re-created it, because we had to shoot it in L.A. for tax purposes. But it’s funny, I’m going to the real hotel next week and doing a screening in New Jersey right there. But we screened in the town of the movie already, and nobody recognized that we weren’t actually there. So I had images. I said, “What hotel would I want him having to stay at? Not the Peninsula Hotel or the Ritz Carlton, but what hotel would be normal?” I pictured Hillsdale, New Jersey, and someone watering their front lawn as he’s pulling up in his fancy car. So I had images, and then the story just unfolded for me. It would be the equivalent of Barry Manilow by any other name trying to go to a Starbucks and re-discover his singer/songwriter. But at the same point, really trying to reconnect and find connection with human beings and family. Capone: I think that’s why that particular hotel is important because there are no distractions. There are no modern conveniences. It’s a pretty bare-bones, nice hotel. If he’s trying to write, and focus on getting clean and reconnecting, you can’t have those rock-star distractions. Capone: That’s his last hurrah before cutting himself off from the world. I love that the banter between the older actors—Pacino and the other older actors—feels old fashioned, and it does feel very much like banter from a golden age of Hollywood comedy. It’s different than when he talks to the younger people; it’s different than when he talks to his family. Was that a deliberate attempt to have that old-school banter? DF: It was. Sometimes, there’s that in between where it’s deliberate, but it’s not conscious necessarily. Clearly, we even reference it with Annette and Al talking about their patter. It’s an old-timey word. “We got patter, kid.” But that is what that feels like. It’s the poor man’s attempt at Billy Wilder. That was very scripted, witty patter between Plummer, who says, “I’ve got my manager hat on right now.” You can almost picture it with the cigar in hand. Whereas with Jen and Bobby and the little girl, the dialogue is a little looser. It was a little bit more improvisational. Not a lot, but a little, and the scripted dialogue was less scripted, if that makes any sense. That was intentional. There’s something about that Annette and Al relationship, and Al and Chris—you can pull it off with those three actors, and it’s like having a toy where you’re like, “Screw it, I’m going to go for it,” a bit of a heightened dialogue. Capone: I’m of a firm belief that a film with Bobby Cannavale is better than one without him, so it was great to see him here. A lot of times, he’s brought in as an exclamation point, for a little comedy or dramatic kick, but it’s nice to see him pull it back. He’s still doing drama here, but it’s largely more relaxed. Were you a little worried about piling up too many barriers between Danny and the family reuniting? DF: I was. I’m always worried about it. I think anything can be done if you think about it. But yes, I was always very worried about it. Capone: If it can be done, it can be overdone. DF: It can always be overdone. And I had Bobby and Al in the same conversation, and these are big theater actors who are most known for some big, gigantic, larger-than-life stuff. So that on top of the taught with the danger, emotional territory that we’re navigating. There’s a scene halfway through the movie on a bus where Bobby discloses stuff that’s a real high-wire act for actors and for a writer and for a director that I knew it going in could be a groaner, right? And Bobby makes a big difference. It’s so real. He’s so masculine and real that for me the treacle gets cut instantly with him, or at least that’s my hope, because he’s so capable. But yeah, it’s a concern. Whenever you’re dealing with this type of movie, you want to get to a heartfelt, sentimental place. You’re dealing with sentiment and you’re dealing with high-stakes drama that comes in late to a movie. I just did a movie in Sundance that I procued called ME AND EARL AND THE DYING GIRL. Capone: I saw that movie. It’s one of the best movies I saw there, actually. I didn’t realize you had a hand in that. DF: I produced it. I found the book a long time ago. Capone: There’s not a whole lot of sentimentality in that movie. DF: Yeah, it’s completely pulled back, but it has every reason for you going into it to think it would, and because of that, the first time I saw that film, Alfonso [Gomez-Rejon], the director, called me into his edit bay—myself and my fiancé were maybe the first people to see it, because he came back and had his director’s cut. I saw it. It was a little long, but he had finished it, and I said, “Alfonso, I want to say the right things.” This has never happened, I just started crying. And I’m not a cryer. Because it was so reserved, it just walloped me. So what we tried to do with ours, which isn’t nearly as heavy, but even in the final scene with Al and Bobby and with anything that treaded towards melodrama, is keep as pulled back as we could within reason. So the final scene is very much shot in a two-shot, distant in a room with Al and Bobby. Bobby never went crazy with theatrical crying. It’s a quiet, understated scene. I didn’t want to get too close with the camera, because I was trying to stay back and let it feel organic. 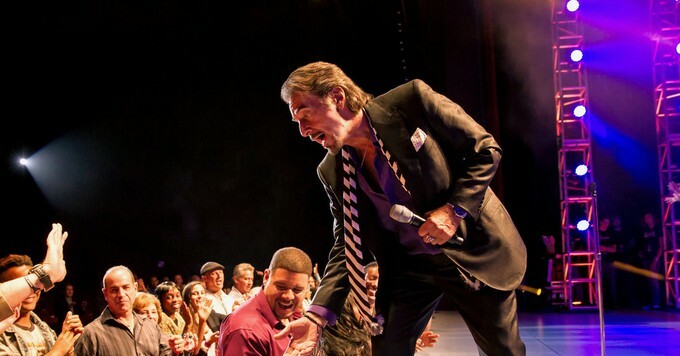 Capone: Let’s talk a little bit about the life of Danny Collins and the music. I said last night that the opening scene is one of my favorite scenes, because it sets the tone, in that you get a taste of Danny’s early music, which is nothing like the music we hear him play in concert. It’s stripped down, it’s acoustic, it’s beautiful. And that kid that you found to play him, talk a little bit about constructing that scene. What did you want to get across in that scene, and where did you find that young actor? Capone: A lot of attention to detail and equipment in that scene. DF: It’s crazy. And the graphics as well. Just the magazines that are on the walls. They feel like a real magazine from the ’70s. And Al’s cover art on his albums. But it was important to me at the end of the day this is like a dramady and a comedy, and so those can often be dismissed, but I wanted to set a tone in the opening that we were doing a real film here. So that was part of the construct. Steve Yedlin shot it, who does all Rian Johnson’s stuff, so everything from BRICK to LOOPER. He’s a brilliant DP. And we tried to set even the color palate and the way we shot, there’s something about when you watch the 1970s that looks different than when you watch 2015. It’s kind of a 1970s feel the whole movie tonally, I think. We tried to sell all of that. Ryan Adams wrote the original song that is playing in the background. It’s one of two originals he wrote for the film. It’s actually an old song of his, and he said, “I’ve always loved this song, but I’ve never quite known what to do with it.” He played it, and it’s so authentic to this guy when he’s just starting. And so we put that on in the background. We cast Nick [Offerman as a magazine writer interviewing Danny Collins for the first time]. Capone: I don’t think a lot of people are going to realize it’s him. DF: I don’t think so either. That was part of why I wanted him. He’s got that hypnotic thing. Capone: But then when he giggles, forget about it. DF: I said, “Nick.” I don’t know him. I said, “I’d like you to be in this movie with Al Pacino.” He goes, “Awesome. I’d love to do it.” I go, “But you’re never going to meet or be in a scene with Al Pacino. You have the opening scene.” We’re still trying to arrange a dinner between them. Nick’s now my muse, because he did ME AND EARL AND THE DYING GIRL as well. But I was like, “You have the opening scene of the movie. It’s essentially a five-minute monologue, just you, and you’ll never be in another scene of the film.” But I needed somebody who could carry that, really own the screen for that long. Capone: You could have gotten away with not showing him, too. That would have been acceptable, I think. DF: Maybe, and we were heading there if we didn’t figure it out. I worried that if we did, then what was the point of the construct of the whole opening scene? I worried it would feel like a cheat. I did a five-minute monologue on the back of a guy’s head, and we never showed him. I would have done it differently. I would have probably gone back and re-shot the whole scene. Anyway, my producers put out a casting search all over the world, particularly parts of Italy, like Sicily. And one day we got the picture sent in, and I said, “Guys, did you see this guy that came in? There’s something there.” You couldn’t quite tell from the picture. I have on my phone like 100 pictures because we took them, and we played with everything from the way his hair fell to the bridge of his nose, and Bill Corso who did Steve Carell in FOXCATCHER, did the makeup. Capone: But you said you didn’t use any prosthetics. Capone: Tell me about “Hey, Baby Doll” versus the song he’s writing throughout the movie. That was Ryan’s other song. Capone: That one, he wrote that for the film. Did you give him any direction as to what you were looking for? Because that song is meant to feel more lived in. Then it was a matter of finding Al’s voice in the song and working with people of figure it out. And where we landed, was this Leonard Cohen-Bob Dylan take. The character in the film is self admittedly saying, “I don’t know if you can call what I’ve been doing singing anymore. I’ve been abusing my voice and body for so long.” So what’s beautiful about the journey is he’s not trying to recapture the skill he once had, because that’s long gone. It’s the attempt that I find most beautiful. So what I find really affecting is just how stripped down and raw Al’s performance of the song is. It really is heartbreaking and touching. I gathered a lot of people—Don Was, Ryan Adams, and other members of the band, and we all sat with Al while he was doing it and were like, “Does this feel authentic?” We hit a point where Don Was was working with, I want to say Trisha Yearwood, and he played her the song just with Al singing and goes, “Who do you think this is?” And she goes, “I don’t know.” They were guessing real people. “It’s not Johnny Cash.” And he’s like, “It’s Pacino.” And as soon as he says it, they’re like, “Oh, my god. It is.” It was really exciting when we got that. Capone: I want to talk about a couple of things you’ve got coming up. I read somewhere recently that you’re doing a pilot with Craig Ferguson. DF: We are right now, yeah. He’s awesome. I head back from the press tour in two weeks, and we start shooting that. Capone: That’s interesting that he’s thinking about doing sitcom work. DF: But it’s not sitcom. It is a sitcom, technically, but it’s a crazy, crazy, brilliantly intellectual pilot. It reads like a stage play, and it’s about an agoraphobe who never leaves his New York City apartment. And the whole first season of the show is, basically, he sees a woman across the street who’s instantly the love of his life. It’s a journey about him trying to get 100 feet across a New York City street in the course of a season of the show. But it reads very, very high-art stage work. It’s going to be very unusual and very special. Yes, it’s defined as a sitcom, but it doesn’t feel like one. Capone: Are you still doing this film Bradley Cooper and Robert De Niro? DF: Yes, it’s called HONEYMOON WITH HARRY. I just finished my first draft of it. I’m sending it to them today. It’s really good. It’s a book I wanted to adapt 11 years ago. It’s a self-published novel, and I didn’t get the gig. I was young—27-28 years old. They gave it to someone else. And then 11 years later, various actors had come and gone. The job became available, and I started from scratch. It’s actually a blessing. I’m really proud of the script. I still have to get it read by Bradley, but I feel like I couldn’t have written it at 28. It’s another one of these, like, I was crying as I was writing it. That’s never happened to me before. I started to tear up as I was writing it. But it’s also wildly funny and it’s going to be a high-wire act. But I think it could be exceptional. Capone: Is Bradley Cooper still thinking about directing it? Capone: Well, best of luck. It was great to meet you. DF: You as well. Thank you.